WR Gehrig Dieter celebrates after catching a TD pass last November. The rich got a little bit richer on Saturday. 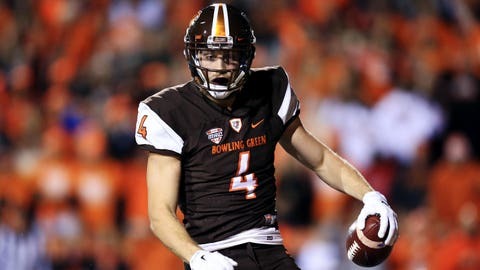 National champs Alabama landed Bowling Green grad transfer WR Gehrig Dieter who tweeted out that he’s transferring. The 6-3, 207-pound wideout was a go-to receiver for one of the nation’s top offenses in 2015. Dieter caught 94 passes for 1,033 yards and 10 TDs. He also ate up Tennessee in the Bowling Green opener going for seven catches and 133 yards. Dieter is set to graduate from Bowling Green in May and then he will have one season of eligibility remaining in 2016. Dieter, a Dean’s list student, will need to get a waiver to become eligible. “We talked to the compliance people here and they felt pretty confident about (getting) the waiver,” Dieter told FOX Sports Saturday afternoon. “He said there have been like 45 people in my situation and they’ve all gotten approved." Dieter, who also considered Wake Forest, said he will take a visit to Alabama this week. He is looking forward to watching film with the coaches and meeting his new teammates, and he is eager to get a better sense of how he’ll fit in the offense, he said. In 2015, the Tide brought on another similarly-sized grad transfer in former Oregon State wideout Richard Mullaney, who caught 38 passes and had five TDs for Alabama. Mullaney, Dieter said, has been a big help in the recruiting process. “He’s had nothing but positive things to say about it,” said Dieter, who runs in the mid 4.5s and has vertical jumped 34 inches. “He said once he got there, he fell in love with the place. A big thing for him, he said, is their receiver room is a very tight-knit group. He said the strength program is unreal and that Coach (Lane) Kiffin is really receiver-friendly." To say Gehrig Dieter was raised in an athletic environment would be an understatement. His parents, both career law enforcement people, named him after Yankees legend Lou Gehrig. His older brother Nolan, a QB at Bowling Green, was named after pitching great Nolan Ryan and his younger brother Thurman was named after late Yankees captain Thurman Munson. Father Derek Dieter, a former competitive powerlifter who once won a Silver medal in the 2002 World Police & Fire Games showed Gehrig how to do Olympic lifts at Lynch’s Gym back in South Bend back when the kid was 10. Gehrig was a standout wrestler and baseball star before focusing on football, and he once set a national record for most receiving yards in a high school game with 437. Gehrig Dieter (far right), poses with older brother Nolan (left) and father Derek. 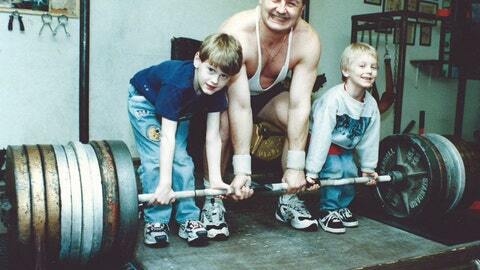 “They (the Dieter kids) have always loved to lift,” said Derek Dieter. "I can’t wait till he gets hooked up with (Alabama strength) Coach (Scott) Cochran because that guy looks awesome. “This is almost like winning the lottery. I can’t wait to see him being part of that team. … My gosh, he’s going to Alabama. Wow." Bruce Feldman is a senior college football reporter and columnist for FOXSports.com and FS1. He is also a New York Times Bestselling author. His latest book, The QB: The Making of Modern Quarterbacks, came out in October 2014.